Country lanes are usually not capable of coping with modern day traffic. This and ‘creeping urbanisation’ can have a negative impact on the character and amenity value of many country lanes in the Surrey Hills. One of the best ways to improve safety is to increase or make use of perception of danger. 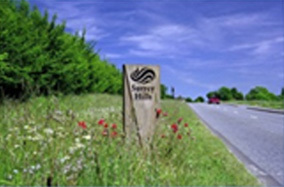 Designing and managing country lanes in line with the following principles will create an environment that is more attractive and help to encourage safer and a more considerate approach to driving in the Areas of Outstanding Natural Beauty. Timber bollards, marker posts and other roadside furniture are more in keeping with the rural scene, don’t need painting, won’t get dirty and are more resistant to damage. Fences, walls and hedgerows should use traditional, local materials and species. Use native species and avoid introducing exotics. Improvements to the roads should consider reinforcing the traditional geometry of country lanes. Concrete keerbing should be avoided. Where possible they should be resisted or in some cases removed. Use edge lining with care, only when other solutions are impractical. Remove unnecessary or redundant signs, whilst amalgamating signs into posts. 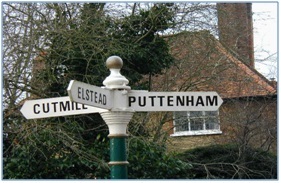 Preserve and restore existing distinctive and historical finger posts where practical. Use traditional black and white signs for street names. Enhance the biodiversity value with appropriate mowing regimes. Less frequent mowing could benefit verges and also result in lower maintenance costs.